10am - depart hotel for a taxi to China Square Central. 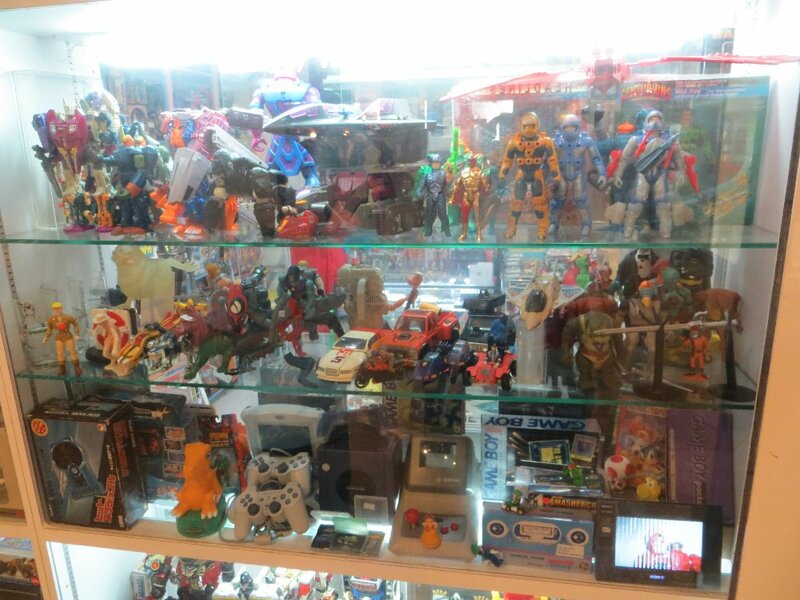 The night before I mapped out the main locations of vintage toys, and planned for us to visit two of the three today. 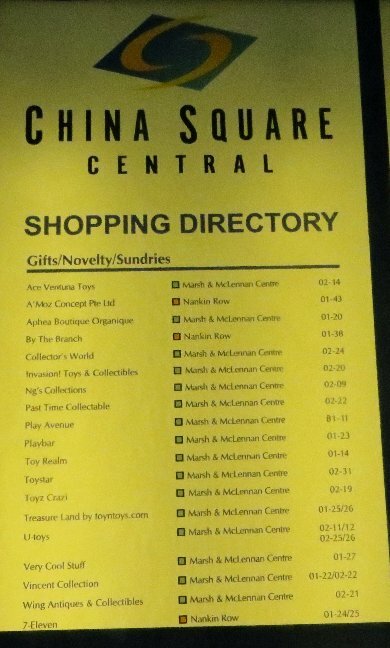 The big one was China Square Central on Cross Street (bottom of the map below), while the second one was near the fortune centre (on the map below). 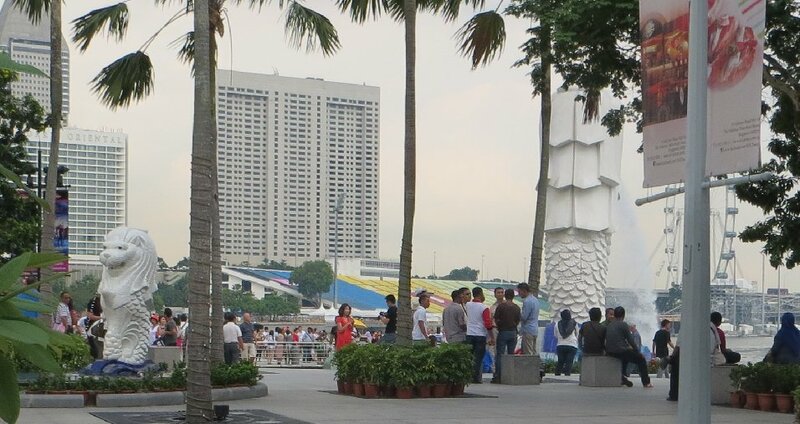 The stop between those two locations (on the map) was to see the Original Merlion statue (one of the things Julian wanted to visit, as it is the contemporary symbol of Singapore). By 10.30 we were at a dingy looking building that was only one block from all the really tall skyscraper CBD buildings. But the fascinating thing about this shopping centre would soon become evident on the directory map (part of which I photographed). 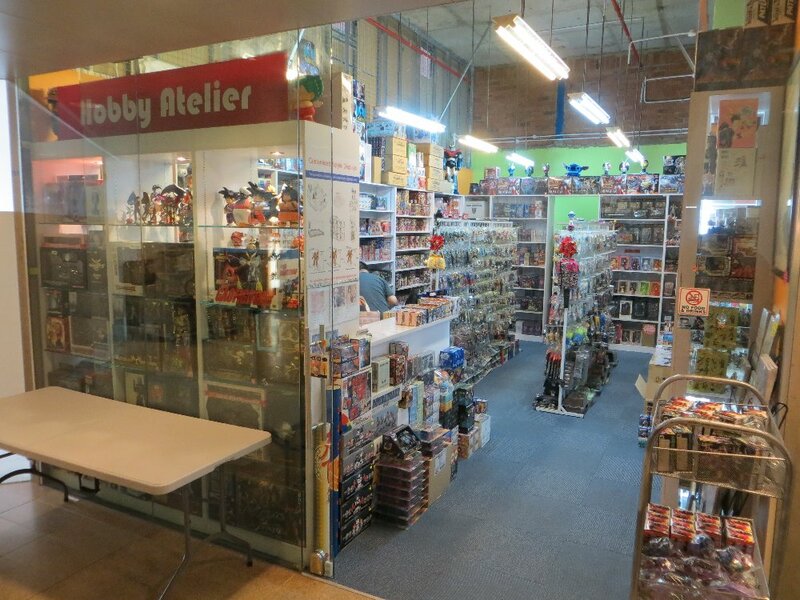 Now I was under the impression that there were 4, maybe 5 collectibles shops here, but when we looked at the directory, a third of the tenants were toys & collectibles. Unfortunately for us, even though it was late in the morning, hardly anything in the centre had opened. 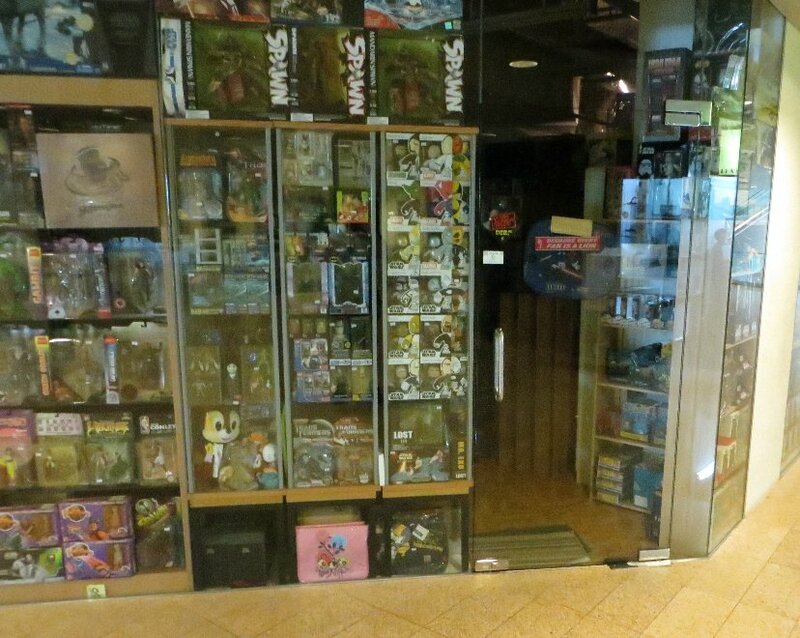 We were there for four hours (until 2.30), going from one store to the next as they opened at different hours during the day (the owners would just show up whenever they felt like it, as they had no need for set hours), but even at the time we left, two of the stores hadn't opened. Which was unfortunate, because one looked like it had a big range of stuff inside. 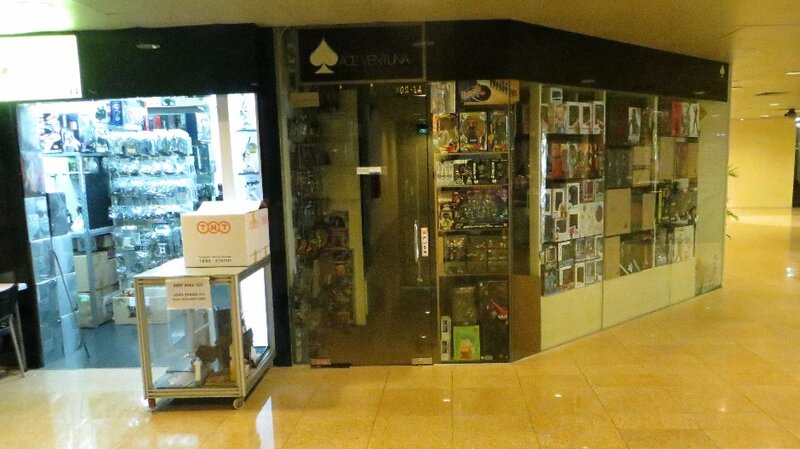 The first one to open was on level one, out in the main floor like a temporary kiosk. 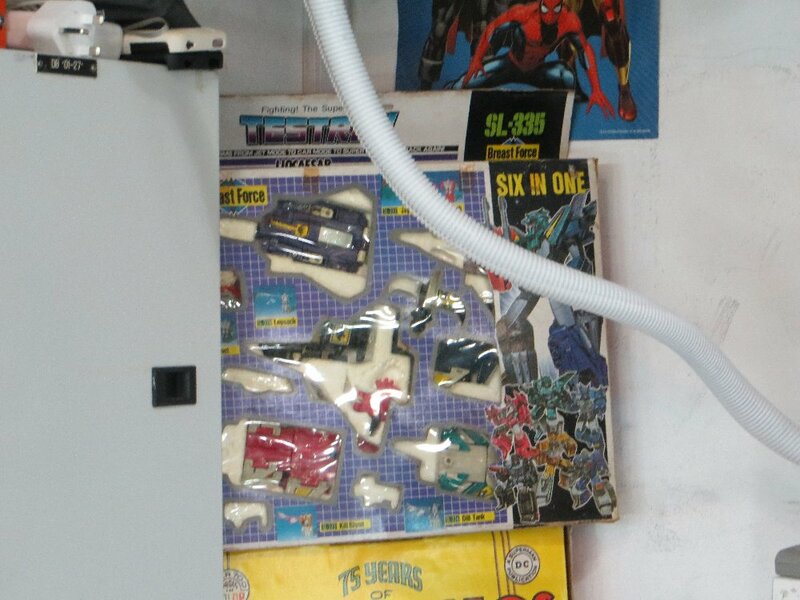 We kept finding these over-sized knock-offs of the leader-class toys, which were 3-4 times the size of the real thing (there's a photo later showing size difference). 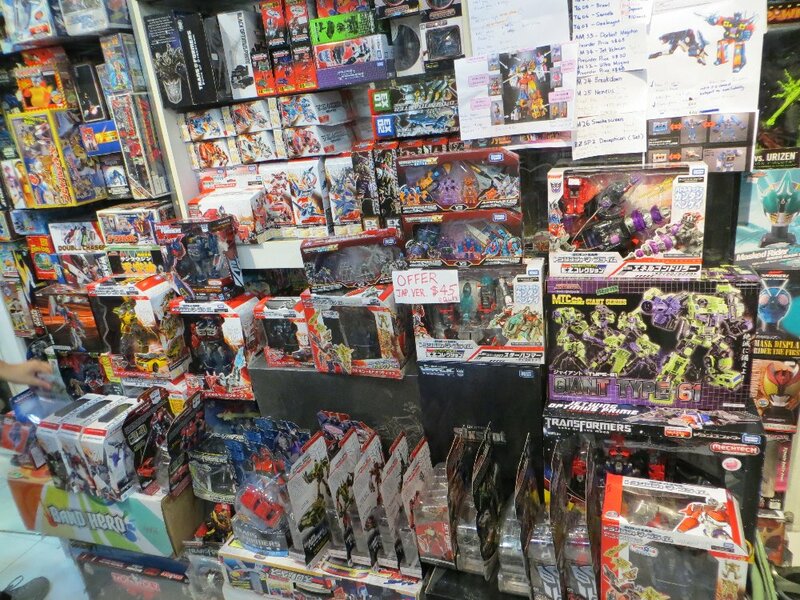 We also found a lot of the 3rd party stuff in these places, meaning that there is a big amount of that stock that doesn't even make it to foreigners online. The rest of the first floor shops were still closed, and it was now about 11am when we went upstairs to see if anything was open yet up there. I was a bit worried that most wouldn't be open at all on a weekday, or maybe open late in the afternoon for the after-work/after-school crowd. A couple on the second floor were already open at this time, but most were still closed. 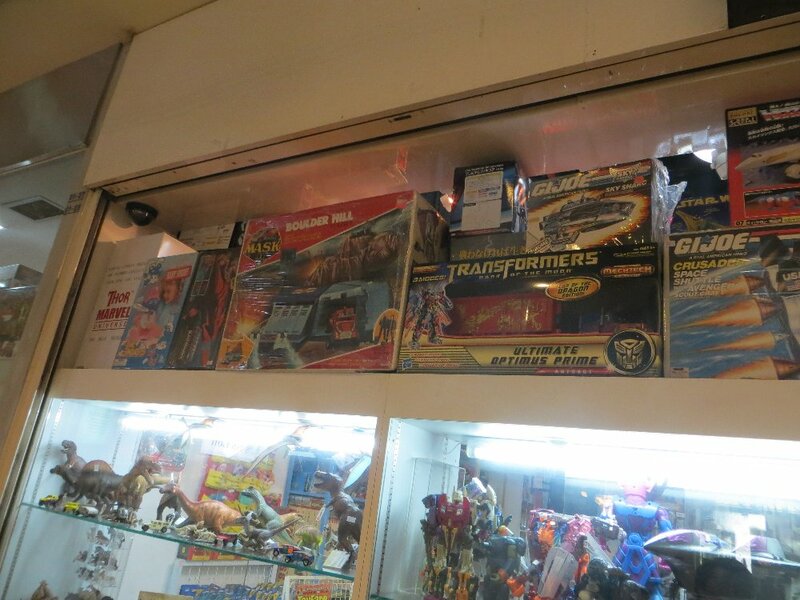 This was the big one that never opened on either day we were there (we stopped back the next day while on the tour-bus)... and looking through the glass, it had a big range of toys, including Transformers. 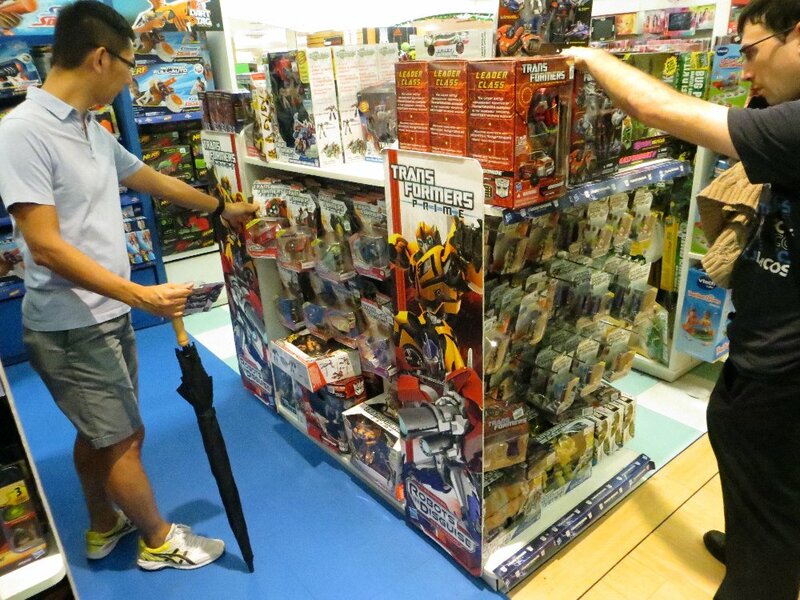 I just hope that it didn't have any vintage JP Gen1 toys. 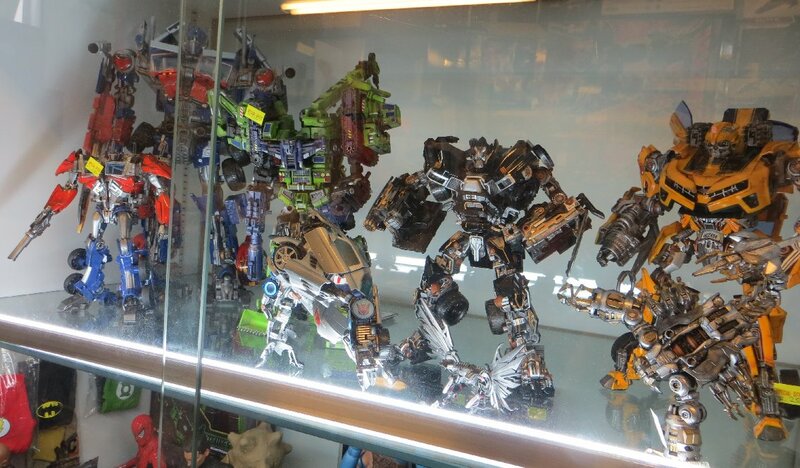 Inside one of the stores was a display of custom-painted Transformers. 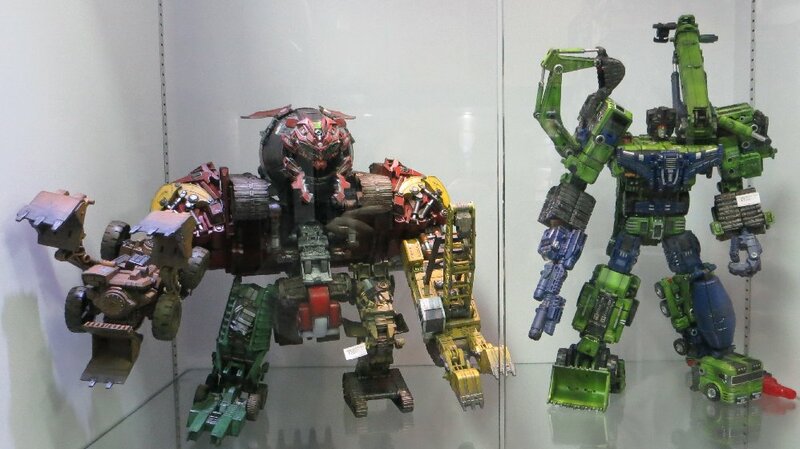 This photo shows the size of the Knockoff toys (Optimus and Bumblebee at the back) compared to a real Leader-class toy (Ironhide in front of them). 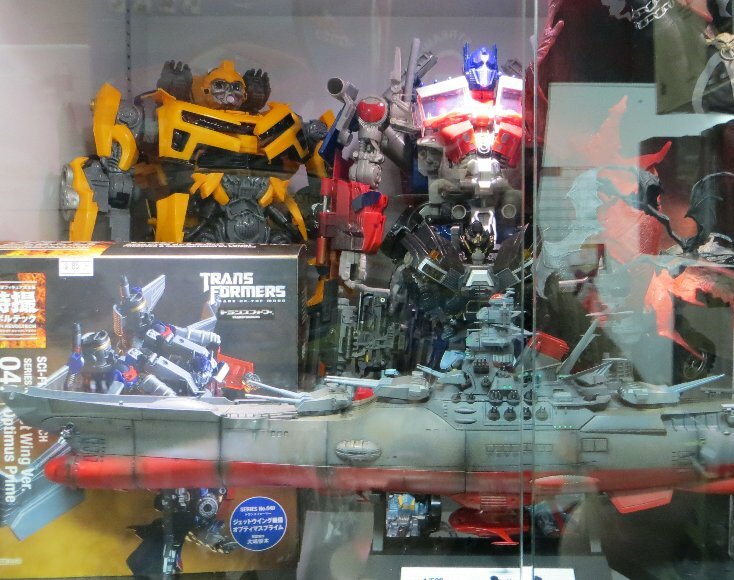 (I didn't need to include the spaceship Yamata in that pic, but the model was so darn cool, I just couldn't crop it out. Around midday and a couple more stores were opening on the second floor. ...a warning for the squeemish. Avert your eyes if you don't like toilet humour... in the literal sense. Two days before (at Universal Studios), when I went into one of the restrooms, something caught my attention from the corner of my eye. I'd heard about them, but never seen one in person.... an Asian toilet. The first I heard of these was back when I worked in a plastic injection-moulding factory that was run by a Chinese family. As such, most of the workers were also Asian. So during my time there, there would be times when I would find footprints on the toilet seats. So I asked one of the people there who I knew would take me seriously, and he enlightened me about Chinese toilets just being a hole in the floor, and you had to squat to use them, for both a leak and a dump. 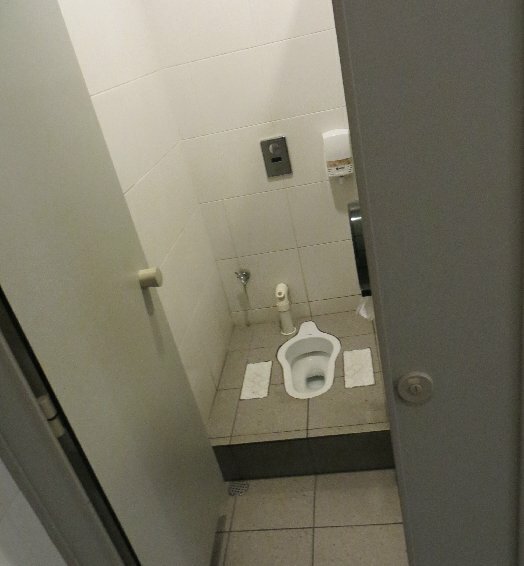 Now, seeing this at Universal Studios, I immediately realised what it was (as most westerners would have had no idea why there was a ceramic hole in the floor of the toilet stall). Naturally I couldn't take a photo of it (to illustrate to my friends, mostly at work, what I was talking about) as there were heaps of people there, which would make me look like a pervert or peodophile for taking photos in a public toilet. But at this place, there was no one because it was still half closed, and I was faced with another Asian toilet. I was a bit iffy about taking a photo of a toilet, because it was rather disgusting, and would probably put people off, but then Julian (yes, I blame him) was telling me, do it, do it, do it. But I kept the image small enough to not show up anything disgusting. For all you westerners, who may travel to an Asian country in the future, this is something you might come across... so now you know what it is. Just before midday we went down to the ground floor and found a small grocery store. 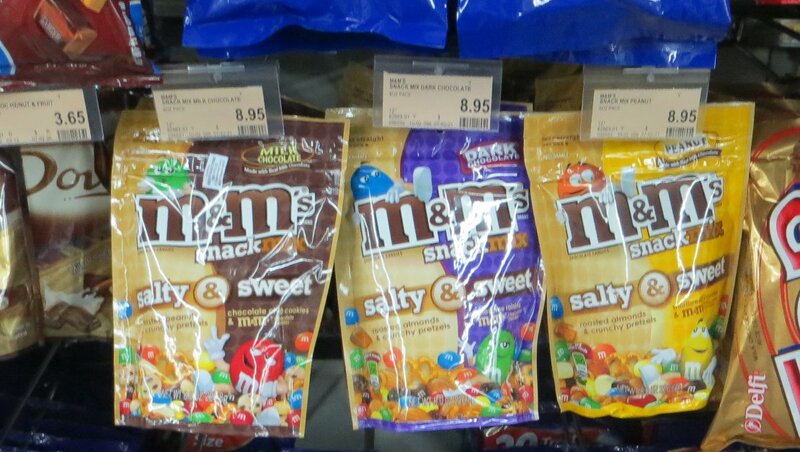 I was still having trouble finding sugar-free soft-drinks, and couldn't risk consuming anything with caffeine in it (like cola), so resorted to grabbing a packet of unusual M&Ms that attracted my attention. I didn't want waste money buying all three to sample them, so just grabbed the milk chocolate variety. Unfortunately, the blending of salty nuts and pretzels with sweet mini-cookies and chocolate, made the whole lot rather yucky. There was too much salt, so we ended up just separating the four things and eating them separately. 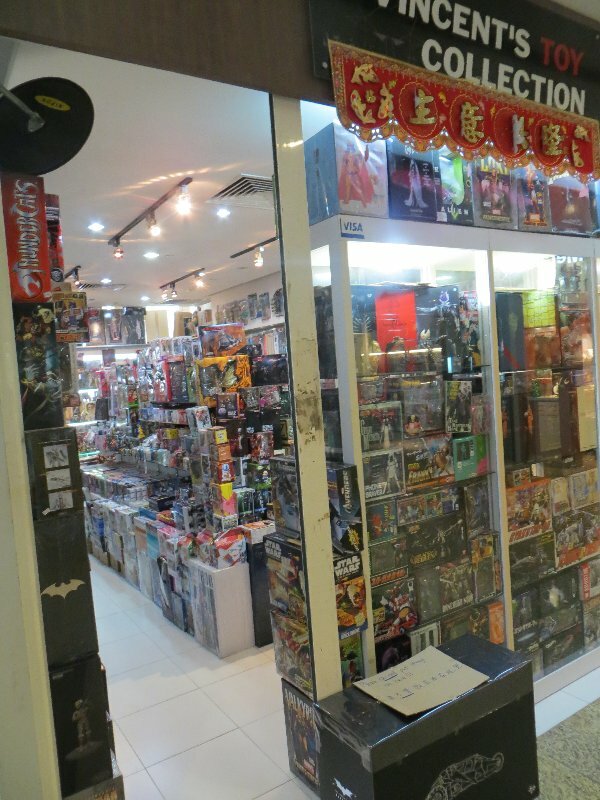 At about 1pm, we went back to level one, and most of the stores there were now open. I guess there is a fetish for these sort of things, but I didn't imagine there'd be so many of this one type. No... I didn't buy any. Back to the real reason I was there... proper toys. 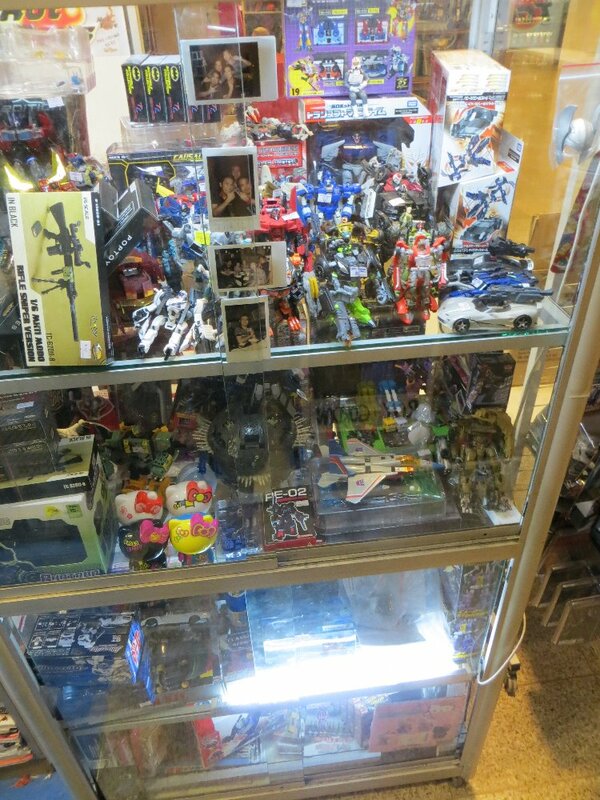 From this store I bought the only Transformers items from this entire centre - a set of 5 KT figurines. So disappointing, but of the small number of items I am missing that I found today, they were all way out of my price-range. 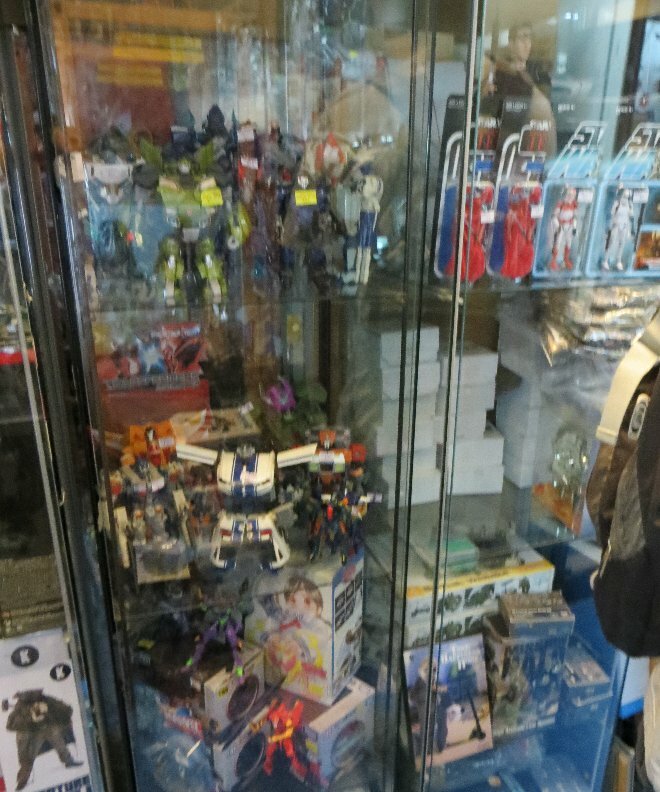 At least Julian managed to buy a Jet Vehicon (for about SG$30 I think). 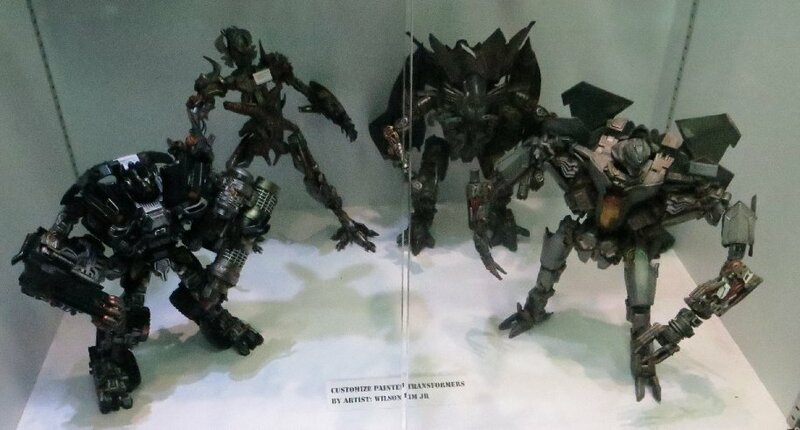 The black box in the photo below was the special convention pack from the Cybertron Convention that was in Singapore in March. 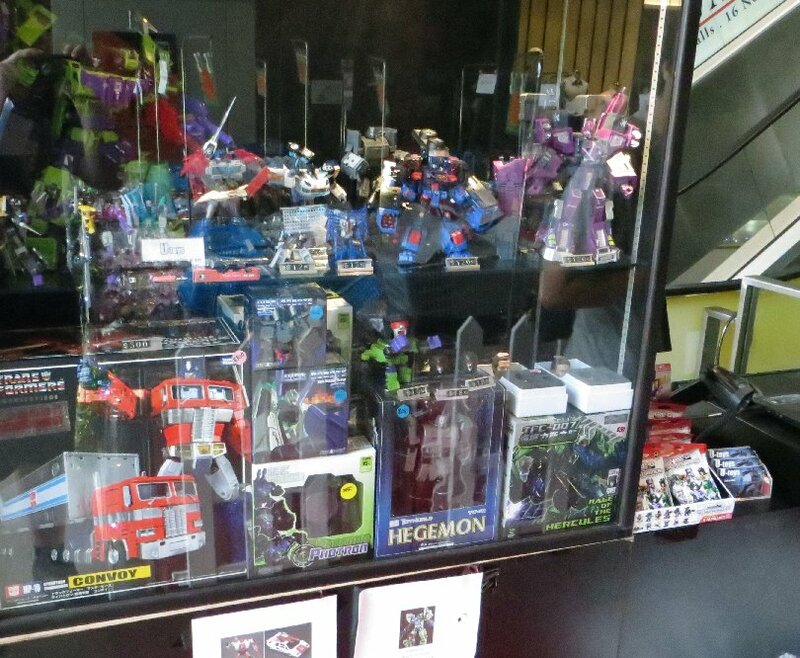 Inside the box is one of those exclusive Optimus w/ Trailer toys, a t-shirt and a badge. 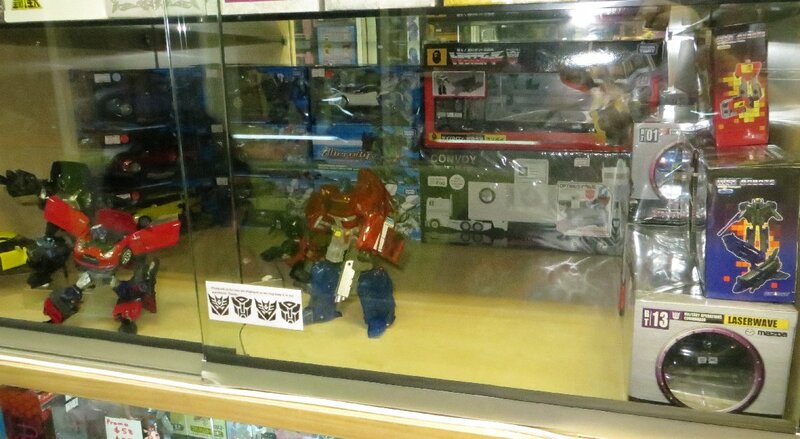 The guy was wanting almost double the price of just the Optimus toy that I bought a couple days ago, which wasn't worth it just for the souvenir element of it. 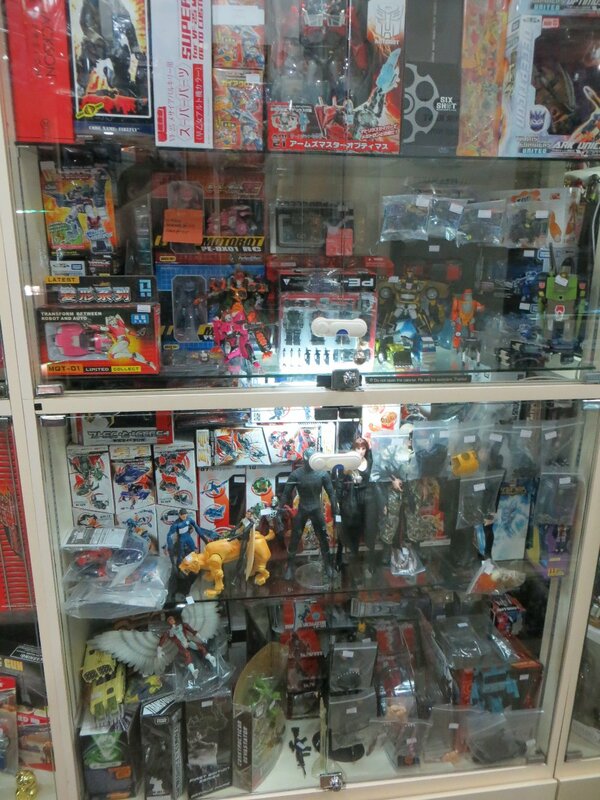 Another couple stores had opened up by now, so we checked them out next. 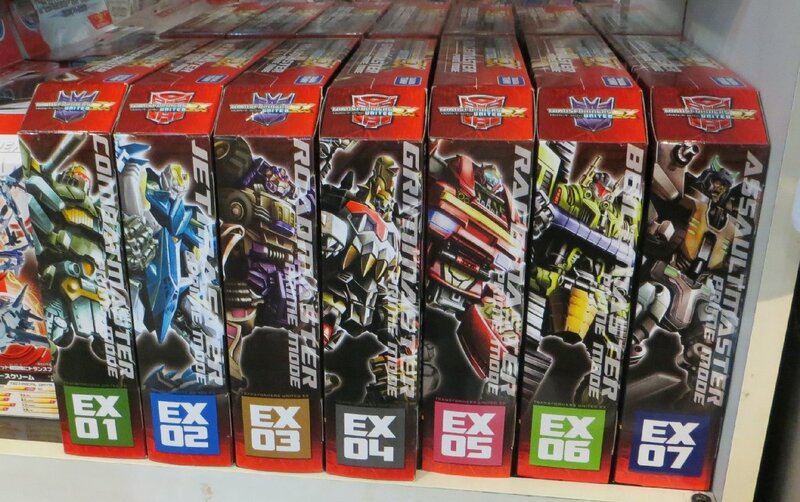 This one had a complete set of United EX-Masters (both sizes), but since they are very expensive, all I ended up doing was taking a photo of their spines for the character art and numbers... because it looked nice. 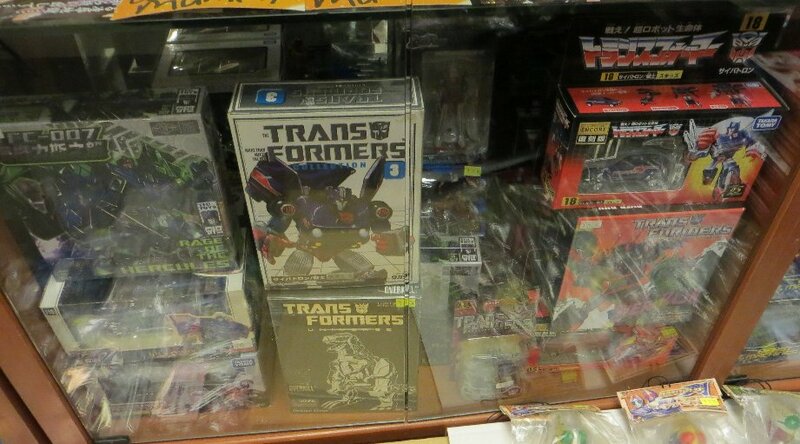 This store had probably the biggest range of Transformers from a range of eras, of all the stores that were open today. They had an interesting poster inside though (photo further down). A movie poster from the first movie. 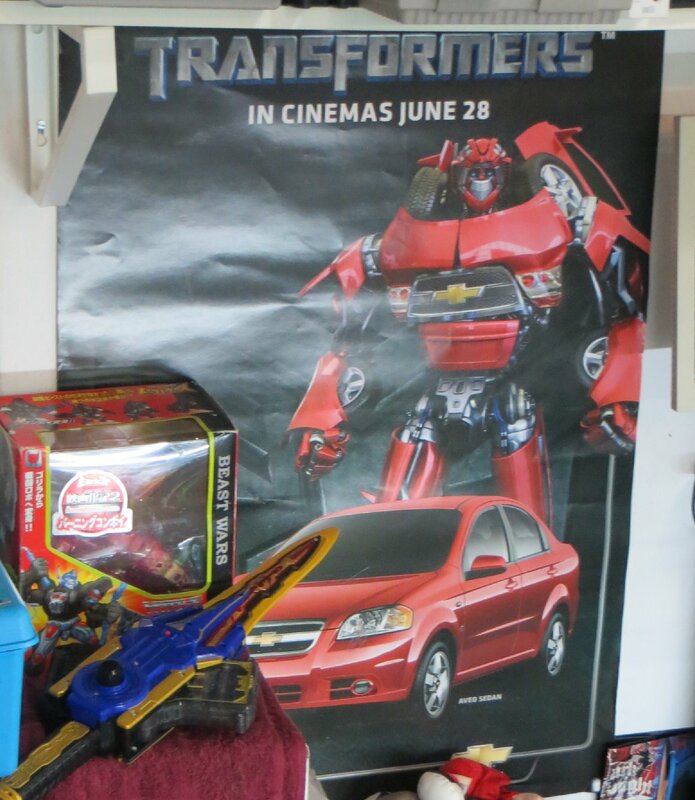 It looks legit, but appears to be a promotional poster for the Aveo Swerve toy. The robot mode doesn't look the same, but the car model is the Aveo, leading me to think that it may have been sent to the European car dealers who were giving out the free toy. If so, it's a rare find, as I've never seen character art for Swerve before. I probably should have asked if I could buy it. Next to the poster was something on the other end of the spectrum... a Knockoff. I was starting to think that this KO was as close as I was going to get to JP Gen1. 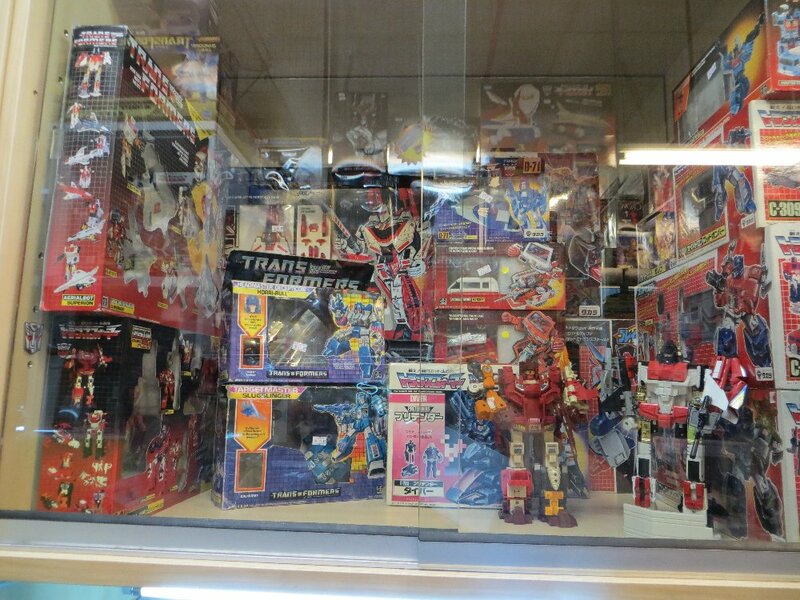 This store was probably more exciting for having the giant 80s playset for MASK in the window... shows how disappointed I was with the Transformers side of things. 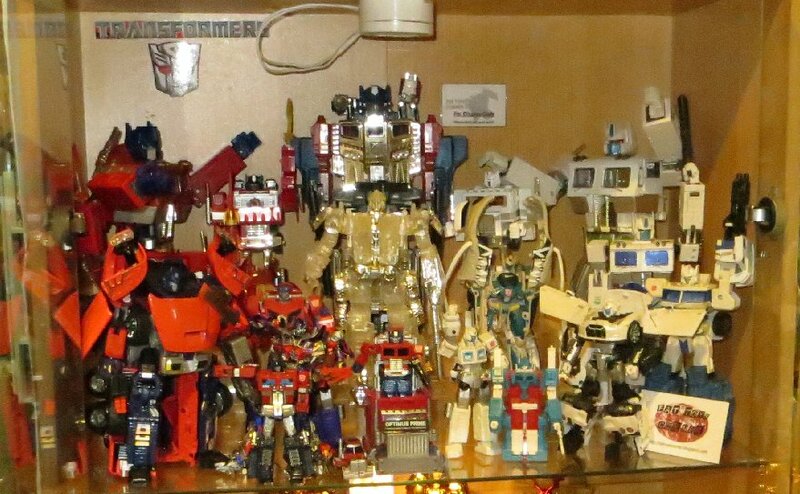 I loved looking at all these "collections", and so did Julian, but at the end of the day, all I had to show for the four hours was five little figurines. It was now about 2pm and one more store had opened. 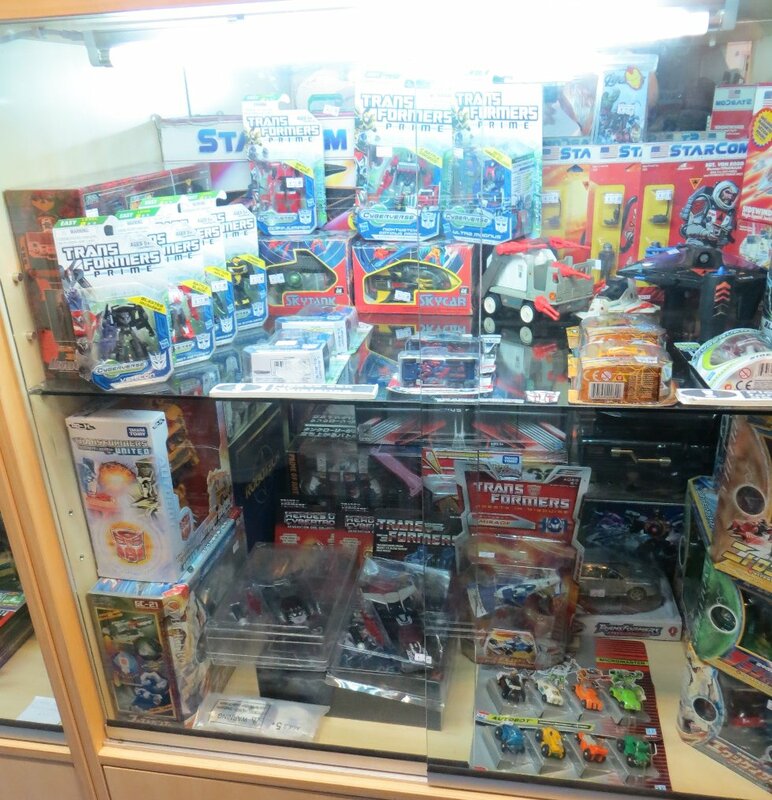 This one had some vintage Gen1 toys, but nothing of interest to me. 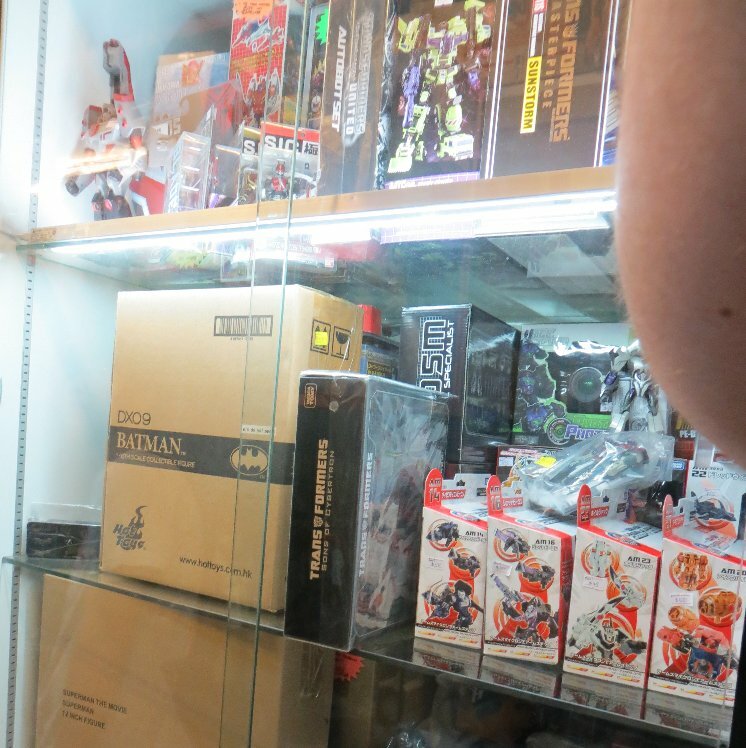 He had a BAPE Convoy/Optimus at the back, but wanted $400 for it. Ouch. 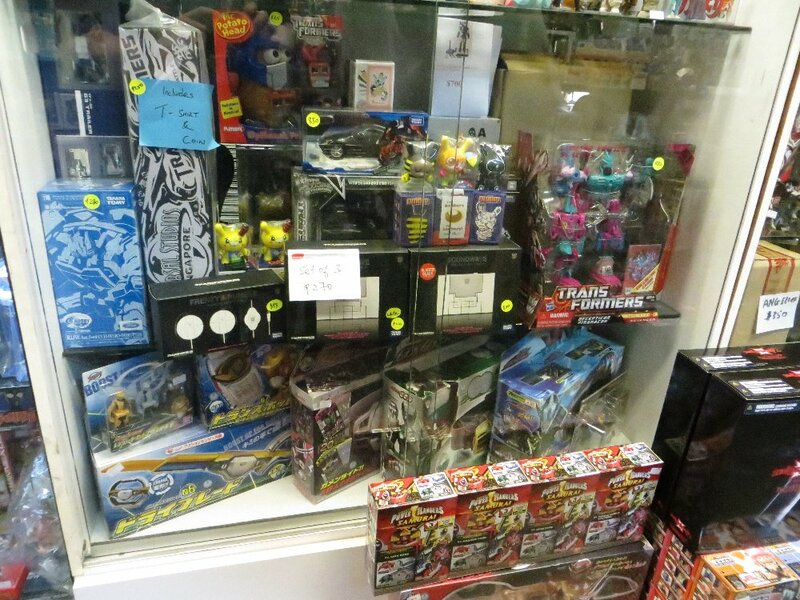 A display out the front. 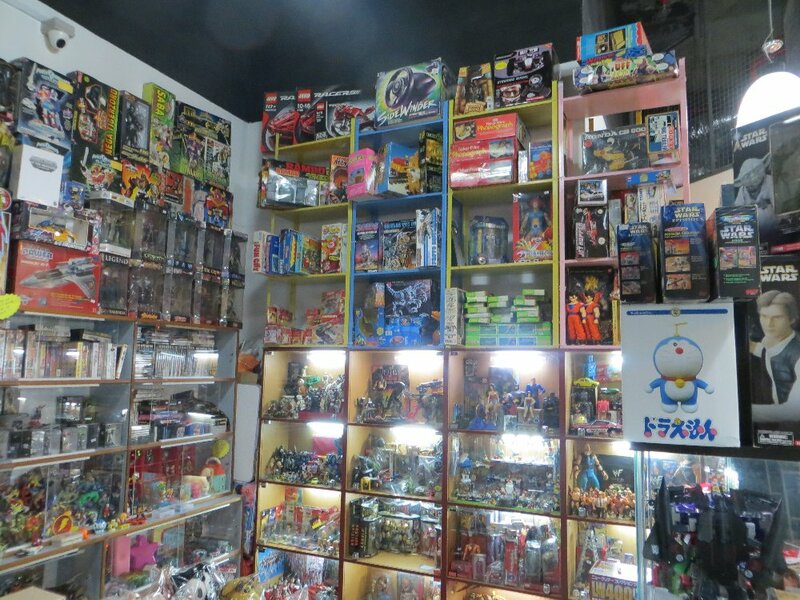 One of the things a store-owner told us was that they worked as a network (the store owners), in that if there were any toys found somewhere cheap, they'd jump on it and make sure that they all keep the prices as high as what a small minority are happy to pay (like on ebay)... forcing the rest of us to pay the higher prices out of desperation, rather than being what they were actually worth. 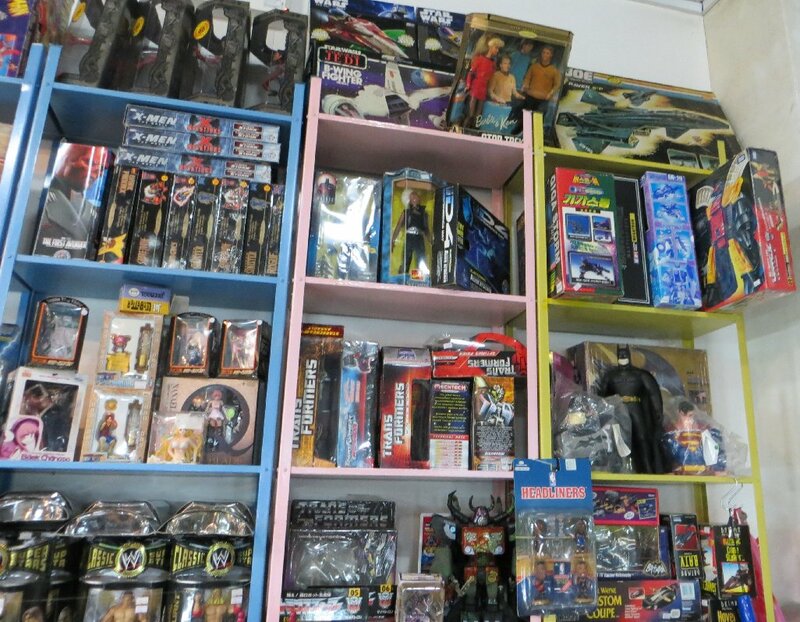 From my own experience, I've seen some people close to me happy to spend a fortune on Vintage Gen1 toys because they have high-paying jobs, without seeing the cost to the rest of us dedicated collectors who cant afford those excessive benchmarks they have now created (the toy dealers think that everyone is willing to pay that much, so will sit on the items for as long as it takes to sell to someone desperate, or another rich collector). It was 2.30pm now, and we didn't want to hang around any longer hoping that the remaining two stores opened some time soon. We went downstairs to the entrance and caught a cab to the Merlion statue... which looked out over the bay to the Marina Bay Sands Hotel. It's a massive construction project that featured on one of those mega-build documentary shows about a year ago. Not sure why it is curved, but it looks like a tidal wave has dumped a ship onto of some buildings. Either that, or the architect was a cricket fan. On the left of it is the Art Science museum (the white glove-looking thing), and over to the left is the tourist "Singapore Flyer" ferris wheel. 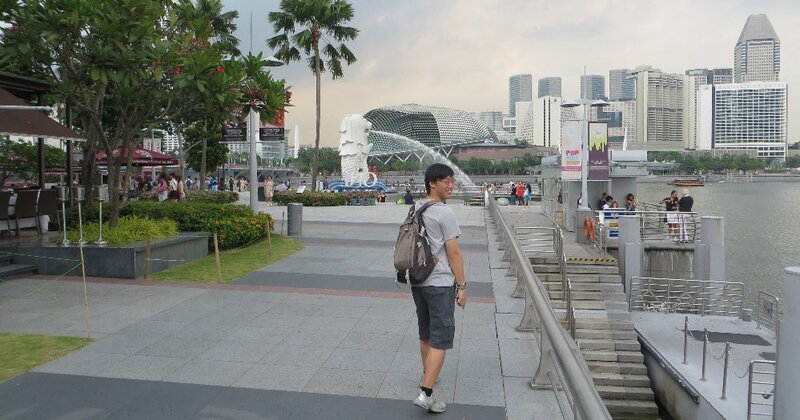 Walking towards the Merlion statue... someone was pretty keen. 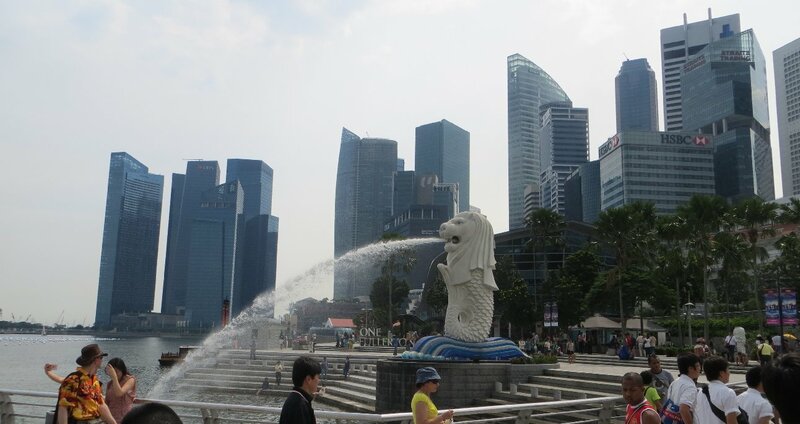 The Merlion is a current symbol of Singapore, and there are only five officially endorsed statues. This one here is the first one, with a second "baby" one behind it (in a photo below). A massive one was also built on Sentosa, while two more are located in other places. We only saw the two here. The round spikey looking building in the back ground is a performing arts/theatre building. 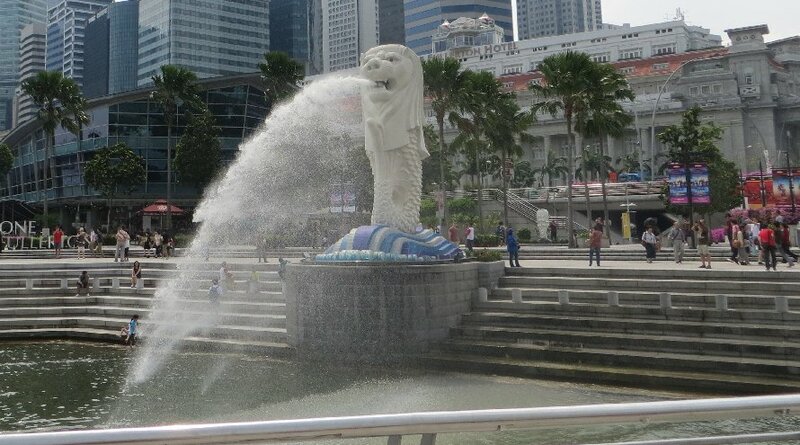 The Cub located behind the main Merlion. 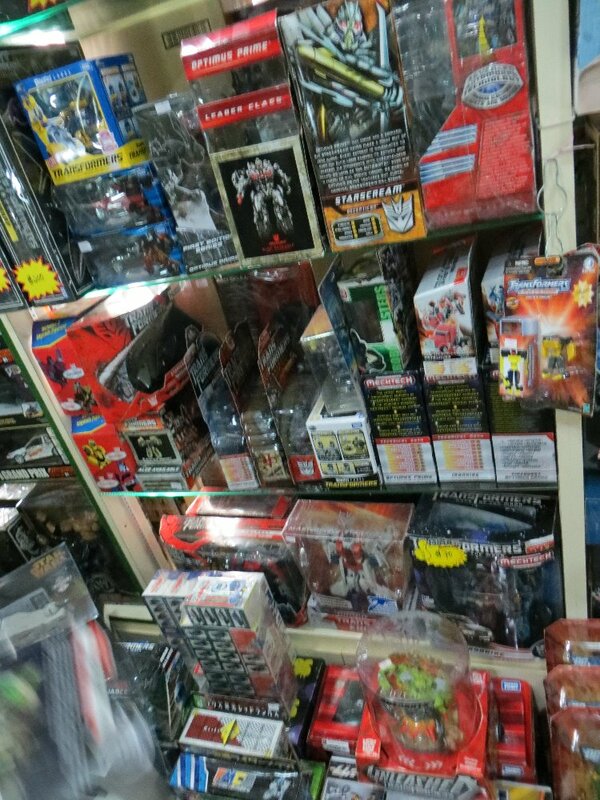 3.00pm - grabbed another taxi, to find a collectibles store (Falcon's Hanger) that had a vague location from Heroic Decepticon's map and list. 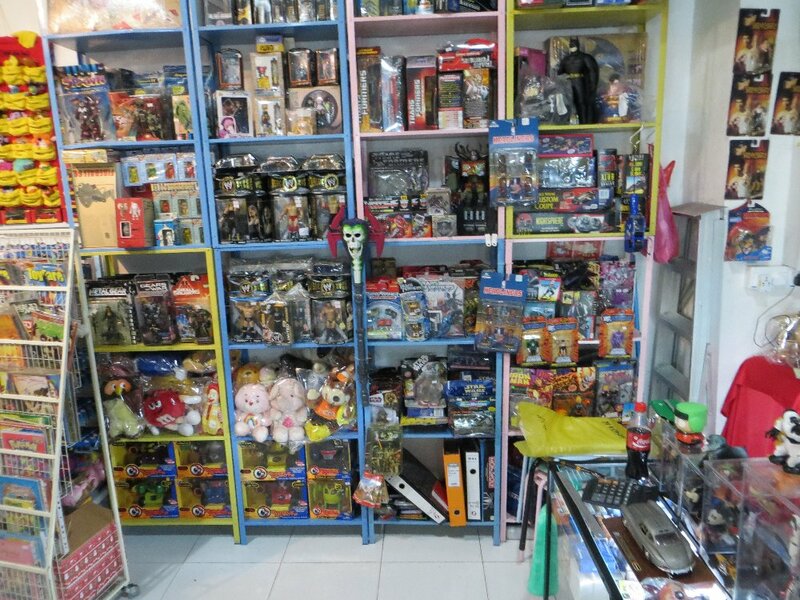 We actually walked around for about half an hour until we finally found it tucked away in an old shopping complex that had mostly car part stores. 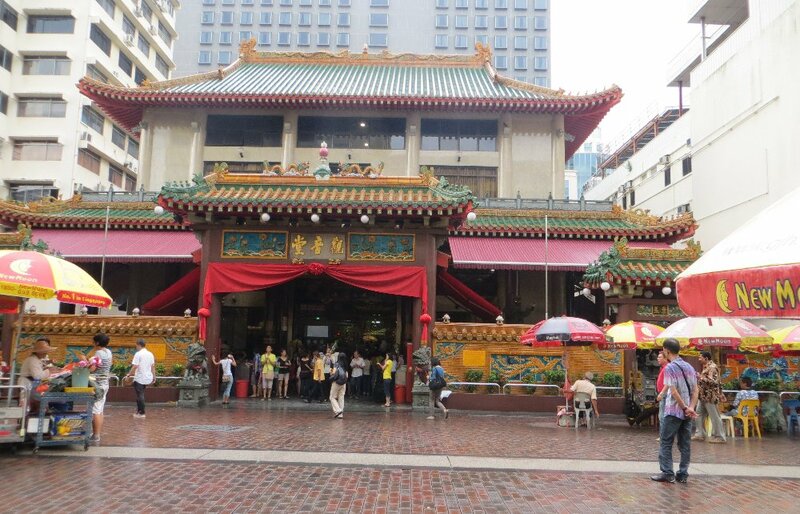 But during that half-hour walk around, we saw some interesting buildings in this part of Singapore. A small selection, but nothing of interest to me. 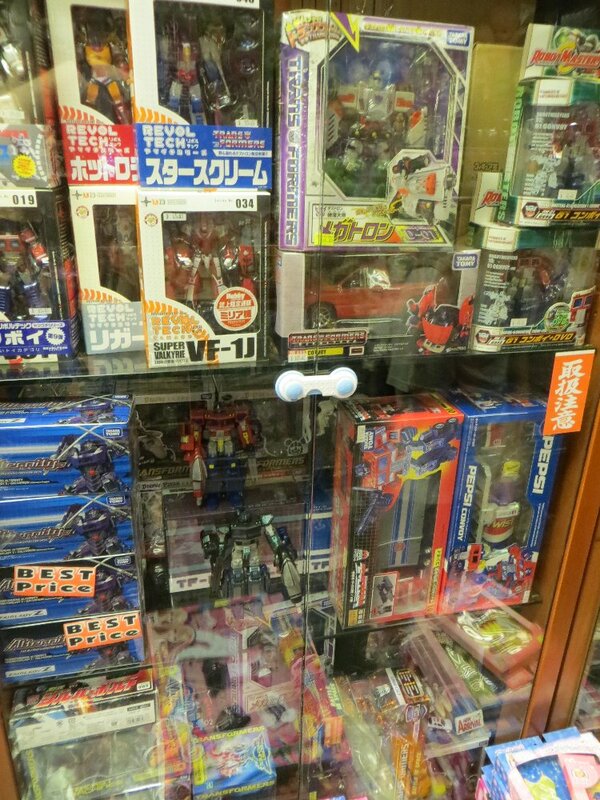 Until I saw a newly-released Arms Micron Smokescreen. 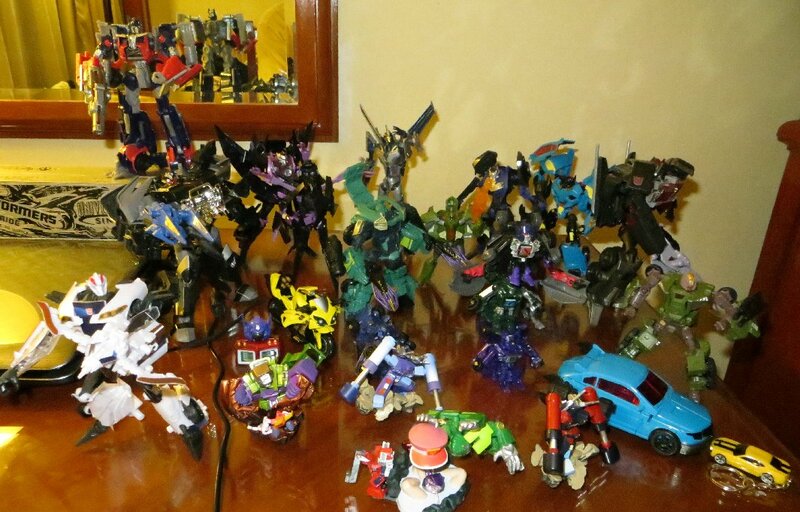 They said it just arrived today, with the Silas Breakdown and Nemesis Prime. The prices they were asking were a bit steep, but by now I was just wanting to go home with something... and at least I'd be saving on postage by not buying online. It was now 4pm and time to head back to the Hotel. We walked back to a taxi-rank we saw when we were dropped off, and waited for one in the queue. Fortunately for us we got a taxi just before it started raining... and when it rains in Singapore, it can surely rain. The unfortunate thing though was that I must have told the driver to go to the "Orchard Hotel" instead of the "Orchard Parade Hotel", because he took us to the one across the road to ours, and since the traffic was really bad at this time, we got out instead of getting him to get us to our hotel (which would have taken an extra five or so minutes). Remember, it was pouring rain... so if it wasn't going to take so long to drive over there, we would have stayed in the taxi. We didn't end up getting too wet, and I was able to protect my new toys by double bagging them and having the opening underneath so that it didn't fill up with rain. Inside our room we started building our Micron models and applying the stickers. I had three to do, Julian had one. At about 5.30pm the rain had stopped, and we headed back out to check out the two nearby collectibles stores that were on our checklist. 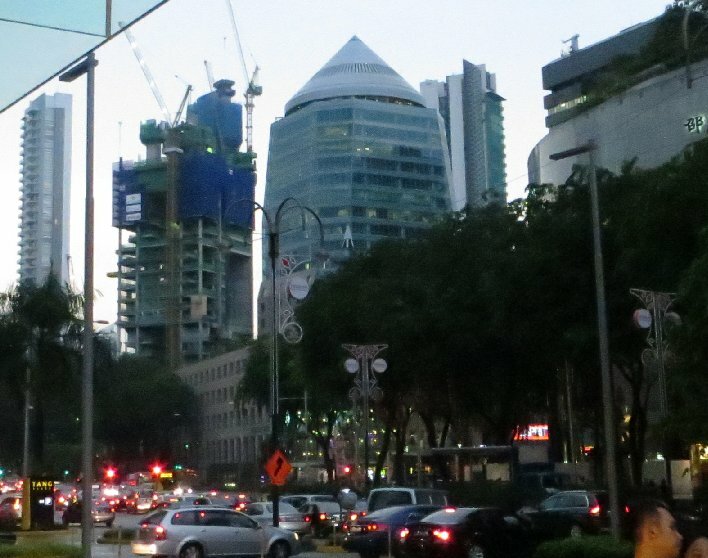 They were just two blocks away on Orchard Road, so we left it until we got back in the evening, so we could also find something interesting to eat as well. First up was the Far East shopping centre. 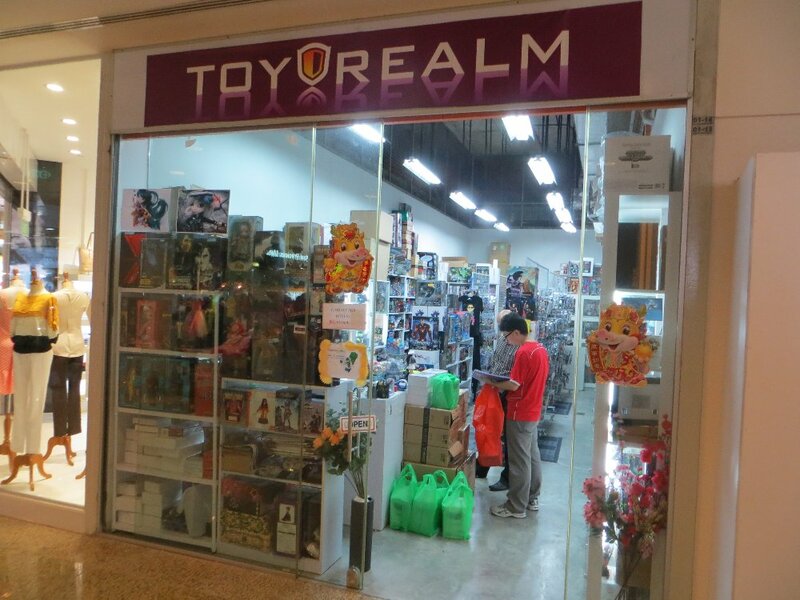 There were two stores in here, but only one had action figures. Nothing for me though. Heading back out to the next couple stops (TRU, HMV, Kinokunya), a building across the road amused my immature mind for being so phallic shaped... Yes, I'm immature. 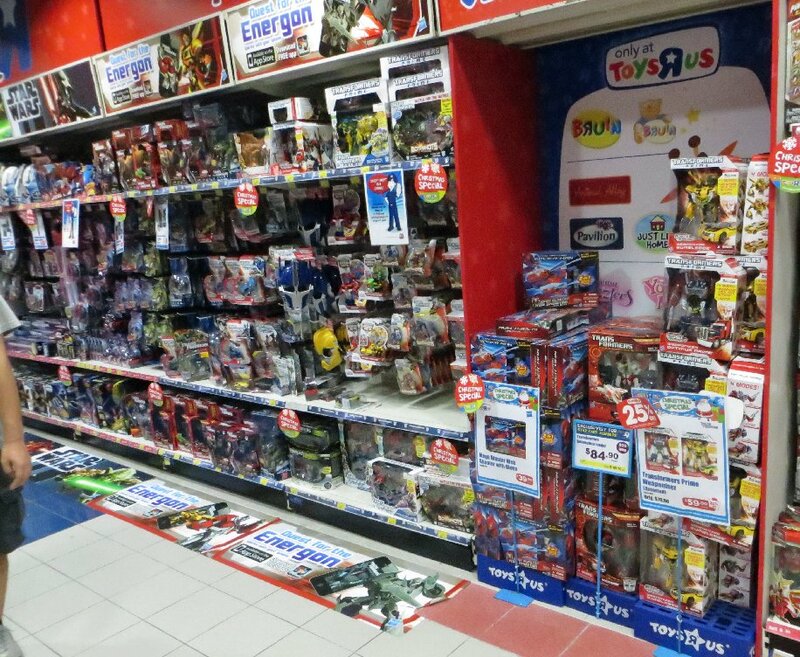 6.30pm - Back at the ToysRUs store that we were rudely kicked out of at closing time.... we had a chance to get a good look over what they had this time. 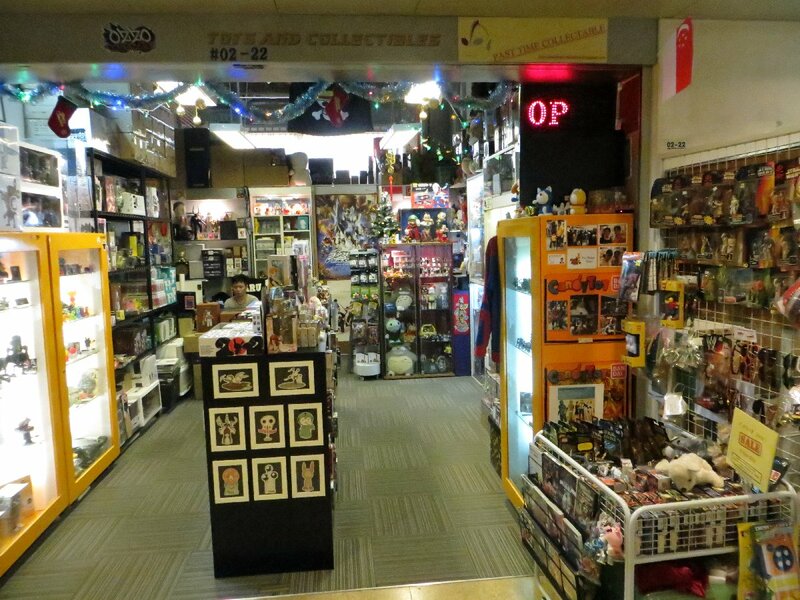 We didn't find anything new, so went across the road to the Kinokunya bookstore, to see if they had any collectibles like the Australian stores do. They didn't though. But it was the biggest bookstore I've ever been in. It was so huge, we felt like we got lost (it was a bit of a maze too - not a squarish sort of floorplan). 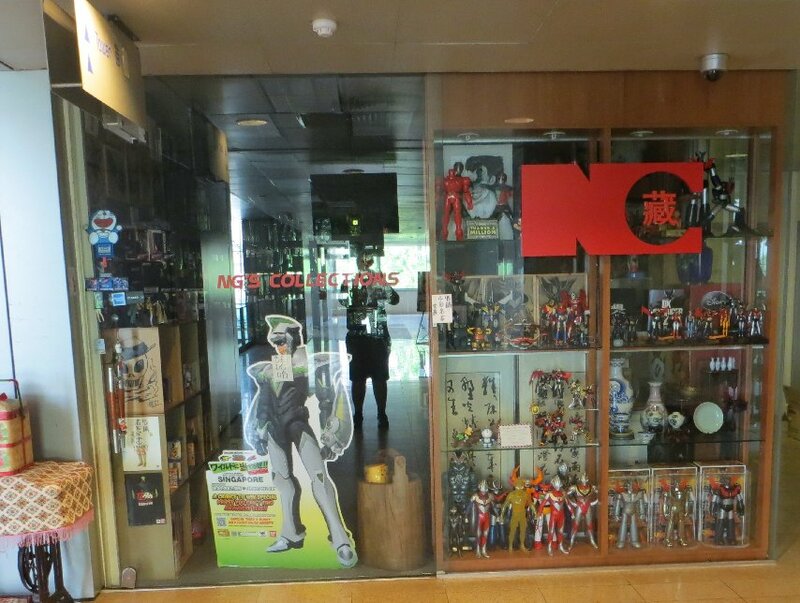 The more interesting thing was the Japanese Department store in the same building as the bookstore. 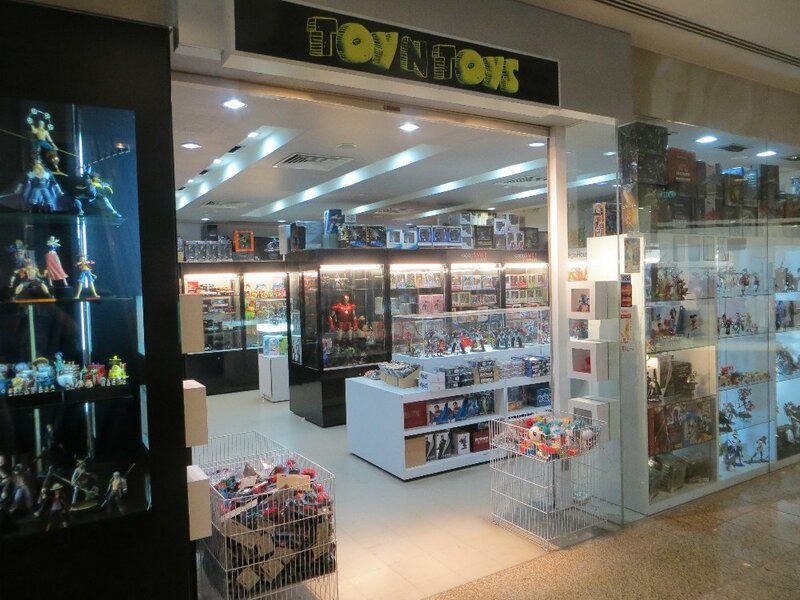 It was the only retailer we found toys in that wasn't ToysRUs. 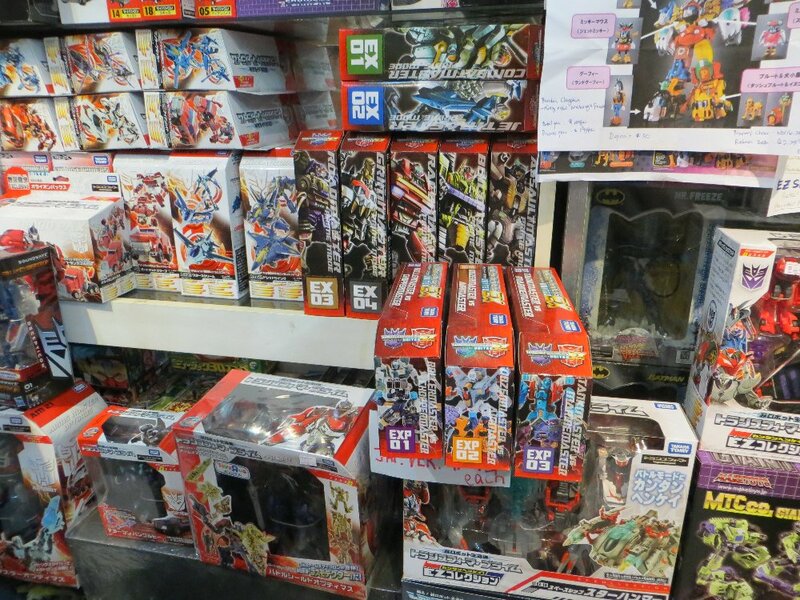 No wonder the prices are so high in Singapore, there's just no competition. 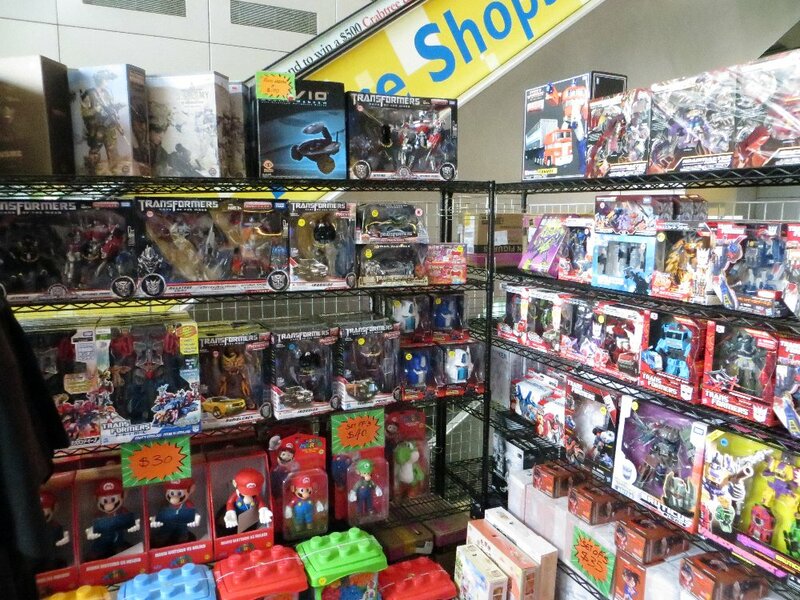 This was the Transformers section of the toy department in that Japanese store. 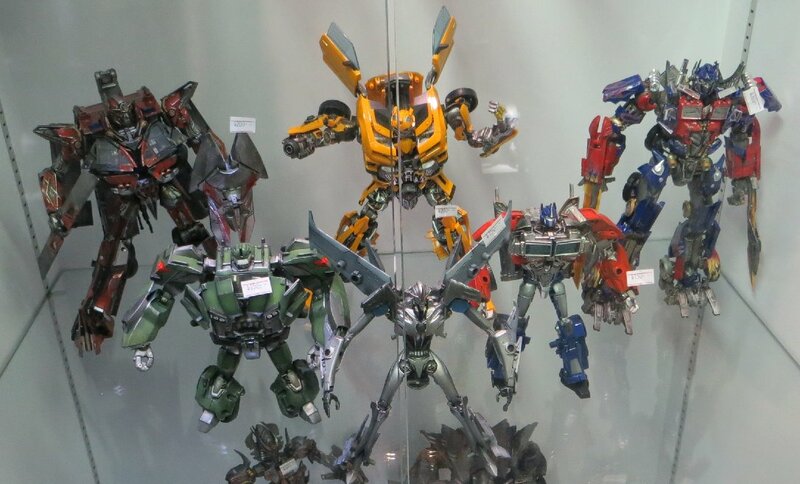 There was this white guy (with an english accent) while we were there, looking over the Transformers and trying to describe to someone on his phone what was there. 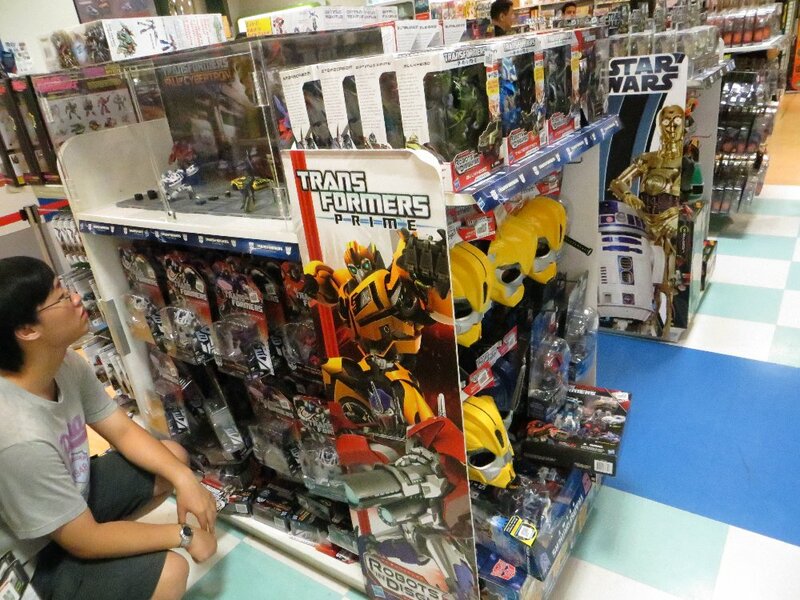 If you think it is frustrating trying to describe to a store attendant one Transformers toy out of the hundred they have in stock, this was like the reverse, as he was trying to describe figures and their packaging/series, to what must have been someone back in his home country because the comments were related to what was not available to who he was talking to. Also in this building was a Lego shop. 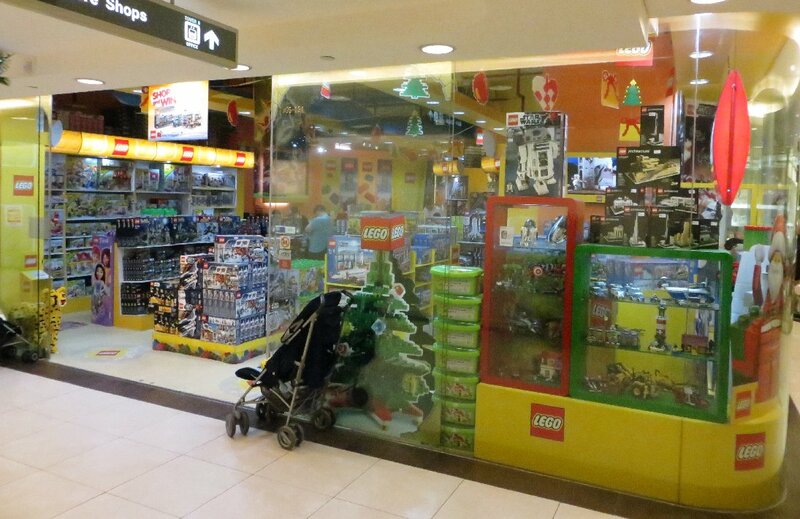 Yes, a shop that only sells Lego... from tiny minifigures, to massive Star Wars sets. 8.00pm - Next up was a trip to a HMV store we knew was somewhere close by, but didn't know the exact address. All we had was the name of the Centre it was located in... which fortunately for us, was well lit up for us to see from out the front of our last stop. The reason I needed a HMV store was because two days ago at the Suntec Centre, I bought some movies but didn't realise that I had been over-charged on one (it took Julian's keen eye of unimportant details to spot it). The movie (Xmen First Class) had been recently discounted to SD$12 (AU$10) from SG$29. I was keen to get it because the DVD version released in Australia has no extra features... the Singapore version has deleted scenes, which is my favourite DVD extra. Anyway, when he noticed that my copy had two barcode price-labels on it, I checked the receipt to realise that the wrong one had been scanned. And since I paid with my card instead of cash, I didn't notice it. I didn't think we'd be back at the Suntec Centre, so looking at the bag they put the DVDs in, it had a second address that was on Orchard Road. 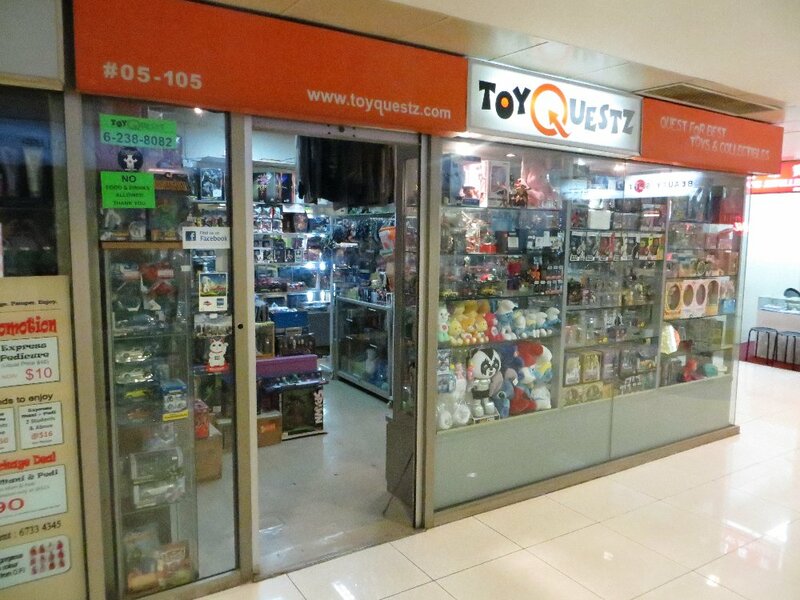 We figured that if it was on our end of Orchard Road, we could see if that store would be willing to fix the error of the Suntec store, and refund me the SG$17 that I was over-charged. When we got in there I asked at the info desk, who took it to a manager, who took it to the cashiers counter... and refunded me the difference. 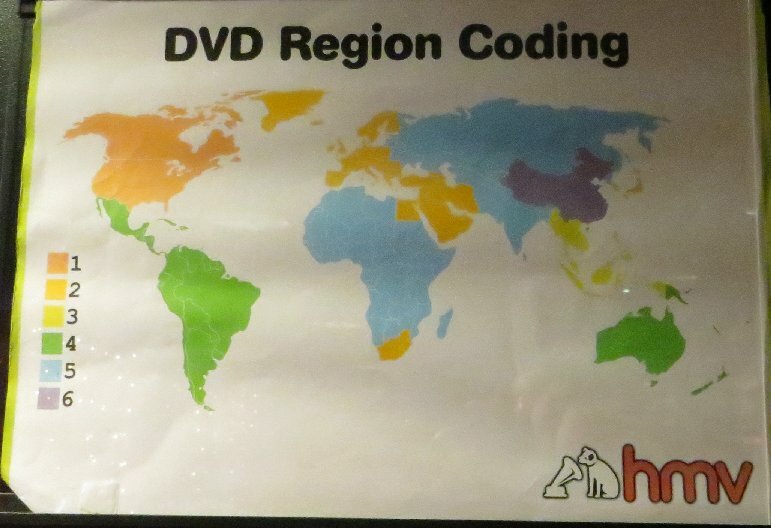 While I was waiting for them to figure out how to do the refund, I saw a handy DVD Region Coding chart on the wall. Sure, there are maps online, but this one is now one I can refer to if I buy any DVDs from foreign sources. We were now past the halfway mark of our trip, so I was already on the look out for big cardboard boxes to pack all my excess stuff into for the flight back. While we were in the Far East Centre a few hours earlier, I saw a couple big, thick, flattened boxes near a garbage exit... and made a mental note to go back there on the way back to the hotel (they were too big to carry around all the stores). So now that it was about 8.30pm, we started walking back. We went to where the boxes were, but in the last three hours they were gone... probably out in the trash already. Never mind. There was plenty of time left to find boxes or cardboard. While we were there, we had a look in the KFC. We'd seen one at Suntec, and I'd laughed at the rice dishes on their menu (another case of "Asian-ising of western food"), so since Julian was tired from all the walking today, he sat down and I ordered a few things to sample. 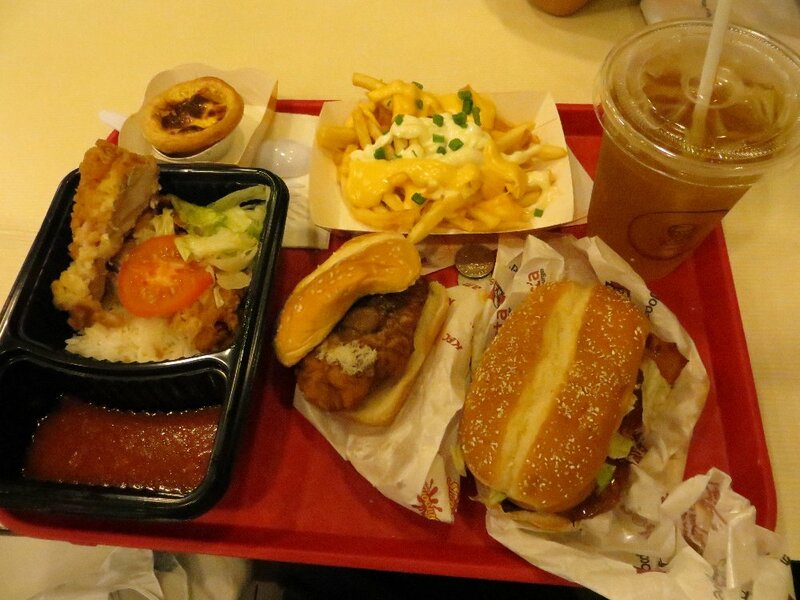 A spicy rice meal (left), egg tart (top left), cheese fries (top middle), green tea (top right - yes, this is all KFC menu items), a Mini mushroom burger (bottom middle), and a roast chicken burger (bottom right - the only chicken item on the menu that wasn't fried and coated in that light brown coating KFC is famous for). I ate all but the two burgers, and took them with me. We went to a lower level at the Far East Centre for Julian to find something to eat (that wasn't so processed and "western"). A noodle dish later and we were heading back to the hotel. 9.30pm - back in our room, tired from the long day of walking. The usual computer, shower, toys, food... until about 1am. 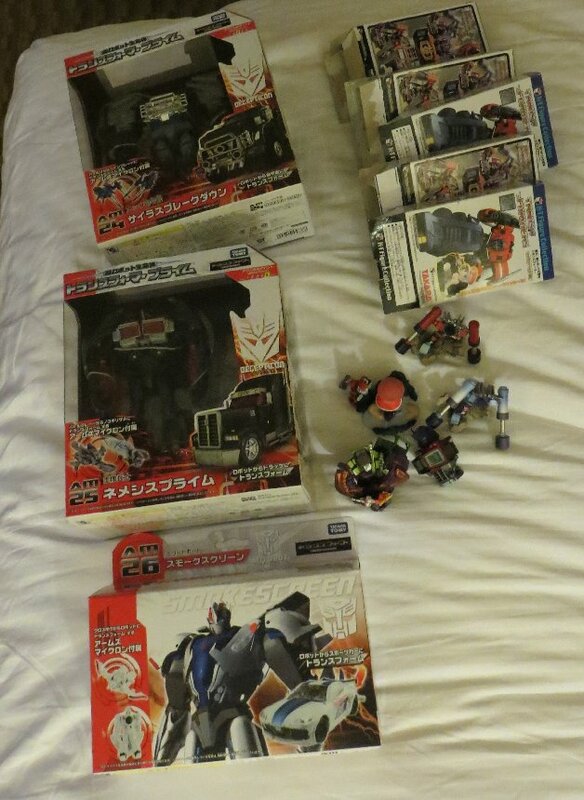 The total toy purchases for me for today. 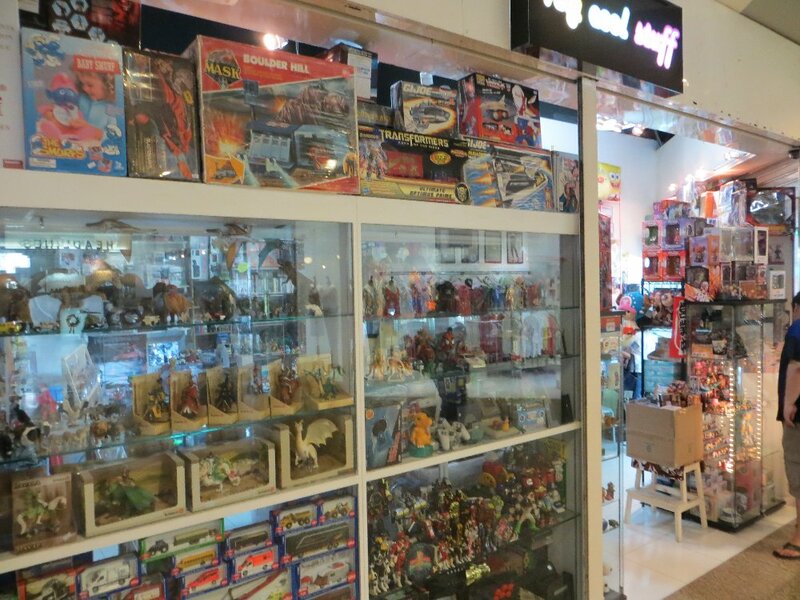 This was supposed to be the day of vintage toys, and all I come back with is 3 newly-released toys and five figurines. They joined the ranks of Dispensor's new army though.